was an often used royal badge under King Henry III, who was born in Winchester Castle and often known as Henry of Winchester and his successor Edward I. Henry III adopted his golden rose from his wife, Eleanor of Provence and this royal badge was then used by the four subsequent monarchs but Henry’s son Edmund, the first Duke of Lancaster, is believed to have distinguished his own badge by changing his father’s golden rose to a red one. In 1283 he brought Somborne Hundred in Hampshire, into the Earldom of Lancaster, establishing a connection between his red rose and the county. Edmund’s red rose subsequently passed down through descent and marriage, to Henry of Bolingbroke, who took the crown as Henry IV (1399 – 1413) and converted the Duchy of Lancaster into an appendage of the Crown, as the personal fief of the reigning monarch, in 1399. The theory holds that this act, symbolised by the adding of a crown to the rose emblem, is the origin of the distinct Hampshire rose and crown combination. 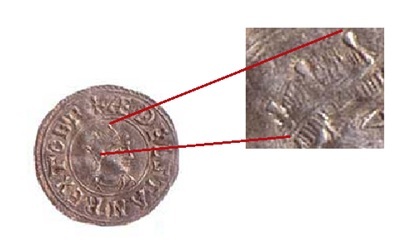 Hampshire history website advises that a combined rose and crown appeared on the fourteenth century staple seal (Statute of the Staple) in Southampton. of the Henry VIII warship, the “Mary Rose”, constructed in Portsmouth and as Hampshire history further relates, a combined Rose and Crown was also the seal of the Custos Rotulorum (Keeper Of The Records) for Hampshire, in the period 1625–1649, the reign of Charles I. Perhaps the use of ostensibly royal insignia in such contexts inspired the local take up of the combination? The table is a presentation of the famous round table of Arthurian legend, where all the knights of the court sat and is believed to date from around the fourteenth century. There is no firm evidence but it is supposed that originally, under King Henry III, the rose would have been typically gold. The symbolism of the legendary round table and the Arthurian age was powerful, perhaps the association between Hampshire and its floral emblem arose from its presence on this revered artefact? People in that era may well have believed that this actually was King Arthur’s round table, allowing for the development of a mystique around the emblem of the rose at its centre and firmly embedding it in popular culture. In the reign of Henry VIII (1509-1547), with the establishment of the bi-colour Tudor rose, the table was repainted to depict the Tudor version, commonly seen in Hampshire emblems. (also blue!) to emphasise its status as a Hampshire town. , Oxford, derive from the arms of William of Wykeham, a celebrated Hampshire bishop. kindly provided by Geoff Merritt of Stockbridge and District Local History. used in Winchester, to seal bonds, under the Statute of the Staple, the city being a “staple” site for wool. This device appears to have become obsolete in the eighteenth century. Referring to the “Statute of Staple” seal, the magazine states that the society thus “…adopted the double rose which was certainly found in Winchester and elsewhere before Tudor times, and has been handed down to a more recent period. The full account of the society’s emblem and its derivation can be read here. 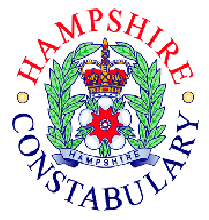 , demonstrating the recognition of the combination as the definitive Hampshire emblem. of the Royal Navy’s, 2nd Mine Countermeasures Squadron, based in Portsmouth, while a Tudor rose is found, for example, on the civic arms of Rushmoor, the Bournemouth rose, as noted, is blue and the rose used by the county cricket team is all white! ; the description in the Hampshire Field Club And Archaeological Society journal that such a design had been used in the county even before Tudor times; that body’s own adoption of a double rose for its insignia; and the example of the “Statute of the Staple” seal. ; and of course the rose on the arms of Hampshire Council itself, as seen. both also display a Tudor rose but without the distinct downwards sepal. at the Royal Hampshire Regiment Museum. of the Hampshire Small Bore and Pistol Association and the uniforms of the county’s Short Mat Bowls Association. “Q: Can individuals or organisations fly the County Council flag? “Q: Can individual elements of the County Council’s coat of arms be used to make up the design of other organisation’s logos and flags? is itself, a highly restricted heraldic charge, which appears by special warrant, obtained for the council’s arms with a specific remit for this deployment. Such a warrant does not extend to its hoisting by the public, the Royal Crown may only be used with permission, as highlighted in this incident. take its rightful place on the national record. where it was used to highlight Hampshire’s status as one of only three counties without a flag, being presented as the proposed design. Upon receipt of the request, the Flag Institute further required the sanction of a county official and declared support for the flag was subsequently received from both Hampshire County Council and the Hampshire Lord Lieutenant, Nigel Atkinson Esquire and the flag was duly registered. Upon registration the flag was slightly reworked to its present form, with a distinctive rose device that mirrors that found on the above illustrated military depictions. The tripple rose, red, white, red, further reflects the variety of roses used to represent the county, its unique design distinguishing it from the roses used on other county flags. The pre-registration design of flag is seen flying below, by HMS Victory, in Portsmouth. on the side of a Landrover vehicle taking part in a rally. The contestants’ names are alongside the flags of their counties, Hampshire is at the top! are also the colours of the Wessex flag. The kingdom of Wessex grew from its initial founding in the Hampshire area, along the coast and around Portsmouth and the status of Hampshire as the founding site of the kingdom of Wessex is reflected in the use of its colours, recalling the county’s important history and proud heritage. flags, used respectively by New Zealanders and Australians, to convey a proud national character, in conveying a proud local one! This entry was posted in Hampshire. Bookmark the permalink.